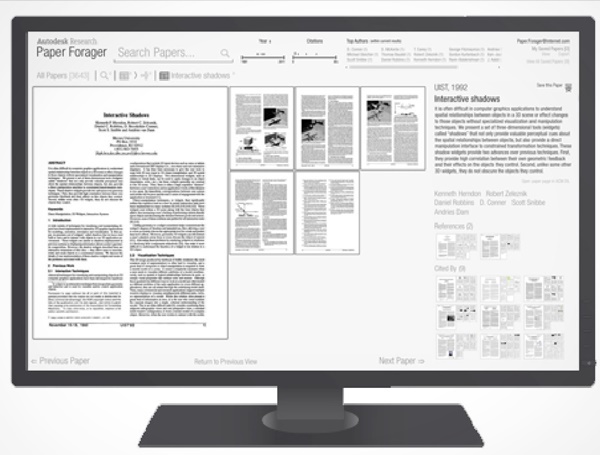 We present Paper Forager, a fully deployable cloud-based system which allows users to rapidly explore large collections of research documents. Our sample corpus uses 5,055 papers published at the ACM CHI and UIST conferences. Paper Forager provides a visually based browsing experience, allowing users to identify papers of interest based on their graphical appearance, in addition to providing traditional faceted search techniques. A cloud-based architecture stores the papers as multi-resolution images, giving users immediate access to reading individual pages of a paper, thus reducing the transaction cost between finding, scanning, and reading papers of interest. Initial user feedback sessions elicited positive subjective feedback, while a 24-month external deployment generated in-the-wild usage data which we analyze. Users of the system indicated that they would be enthusiastic to continue having access to the Paper Forager system in the future.